Ultra creamy, ultra dreamy, garlicky mushroom vegan risotto. So unbelievably rich & delicious it’s hard to believe that it’s dairy free! Risotto has got to be one of my all time favourite foods. The voluptuously rich, creamy texture is just irresistible and I love nothing more than eating it with a large glass of oaky red wine. Before I was vegan I made my risottos with lashings of butter and parmesan cheese. They are generally added to a risotto at the end of cooking to give an extra glossy, creamy richness to the cooked rice. In this Garlic Mushroom Vegan Risotto recipe I sub cashew cream for the butter and the cheese with amazing results. You really won’t believe the glossy creaminess and the extra flavour it gives until you have tried it for yourself. Cashew nuts really are a magical ingredient. You can do so much with them and they really help to make this risotto extra special. 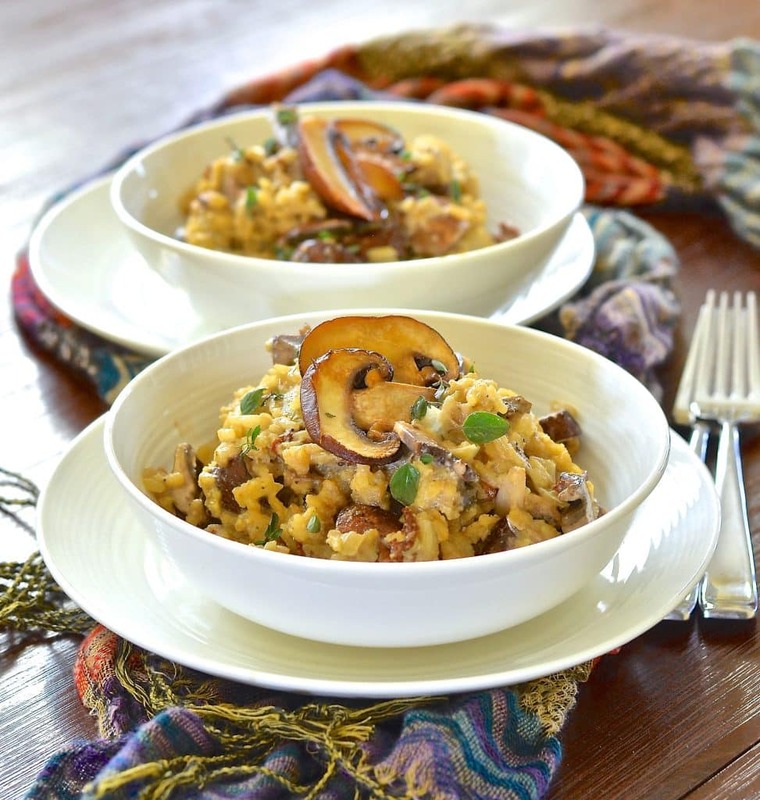 This Garlic Mushroom Vegan Risotto has the most amazing flavour. Woody, earthy dried mushrooms, mellow sweet roasted garlic, and buttery, slightly cheesy cashew cream. All of that combined with the slight acidity from the white wine makes heaven in a bowl. Please do not be alarmed by the amount of garlic in this recipe. It sounds a lot but when you roast garlic is becomes very mellow and sweet so it will not be too overpowering. Taste a clove when you are squeezing it out and you will see what I mean. Risotto is so satisfying to prepare and never fails to impress. You might have heard that risottos are difficult to make but this one really isn’t. You do however need to dedicate twenty to twenty-five minutes of your time to standing with the pan and stirring as much as you can. This stirring helps to break down the starch in the rice which in turn makes the risotto extra creamy. I tend to have a wooden spoon in one hand and a glass of wine in the other while preparing my risotto and it’s strangely therapeutic to stand there stirring and sipping! Try it. You will see what I mean. Risotto is quite a fast moving dish to cook so make sure everything is prepared and ready before you start. The garlic and the cashew cream can be prepared up to a couple of days in advance and stored in the fridge leaving you with just an onion and mushrooms to chop on the day. Remember too that when risotto is ready it needs to be served immediately so again have everything ready, table set etc, so you can enjoy the fruits of your labour at it’s very best. 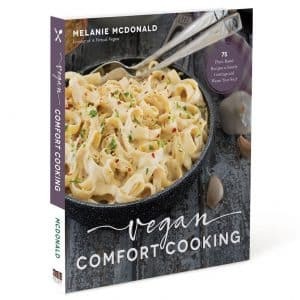 When it is time to make your vegan risotto you can relax, sip your wine and chat to your guests, safe in the knowledge that everything is prepared and ready to go. 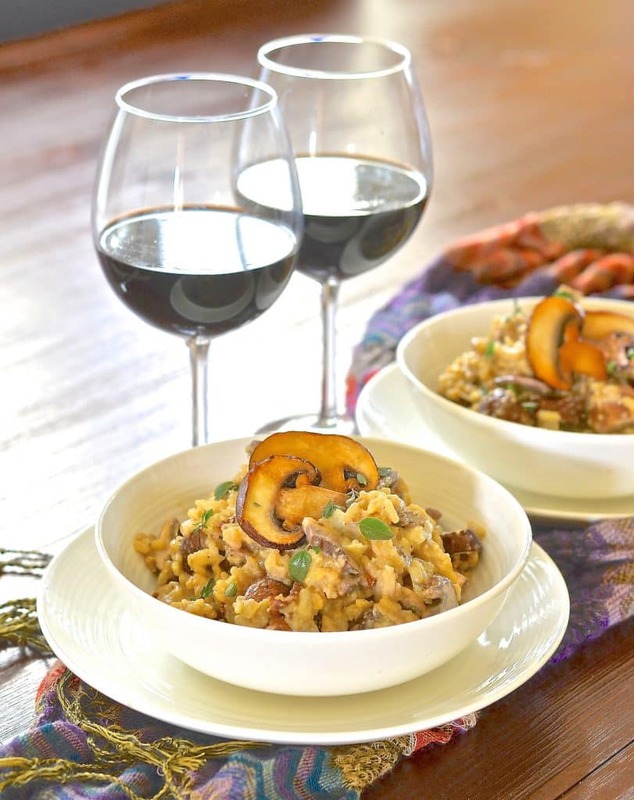 This Garlic & Mushroom Vegan Risotto is perfect for serving at a special meal or dinner party. It would even make a great alternative Christmas dinner. What a refreshing change to just have one pot and a few plates or bowls to wash up on Christmas day! 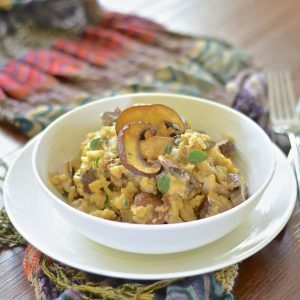 Ultra creamy, ultra dreamy, garlicky mushroom vegan risotto. So unbelievably rich & delicious that it's hard to believe that it's dairy free! 10g | 1/3 cup dried mushrooms (I used chanterelles & morels but porcini, oyster or a mixed blend would also be good. Dried mushrooms are a little pricey but a little goes a long way. Preheat oven to 400. Brush your foil squares with a little olive oil. Cut the top quarter off each garlic bulb so the cloves inside are exposed. Place in the middle of the foil and draw it up around the bulbs and squeeze tightly shut. Place on a tray and bake in the oven for about 25 minutes. Check they feel squishy through the foil. Return to the oven for a few more minutes if not. Put all ingredients into a food processor or blender and process until smooth. Squeeze the roasted garlic out of it's skin and into the cashew cream. If you squeeze from the base up the little soft cloves will pop out easily. Process once more for 30 seconds or so until smooth and the garlic is combined. Put the dried mushrooms in a small bowl and cover with warm water. Soak for at least 15 minutes then squeeze, drain and chop, reserving the liquid as part of the stock. Warm the olive oil in a wide shallow pan over a medium heat. Add the rice and stir for a minute or two until it starts to make little popping noises. Pour in the white wine and add the dried mushrooms. Stir constantly until the wine is almost absorbed. It will only take a minute or two. Gradually add 1.5 cups of stock, half a cup at a time, stirring constantly. When the liquid is nearly absorbed add the fresh mushrooms, stir and gradually add the last half a cup of stock. Keep stirring until almost absorbed again. Check that the rice is tender. If not add a little more stock and continue cooking until it is. Turn down low and add the cashew cream, salt and pepper to taste (about 1 teaspoon of pepper and 1.5 teaspoons of salt but taste as you add so it's just right for you). Keep stirring until it has warmed through again then add the butter (optional but lends a lovely glossy texture) and fresh thyme leaves. To get the mushrooms on the top like I did for a garnish I simply sliced them, put them in a warm pan with a drop of olive oil and left them to cook very slowly. Turning half way. They kind of dry out a bit and go nice and chewy and toasty so make a fabulous garnish! 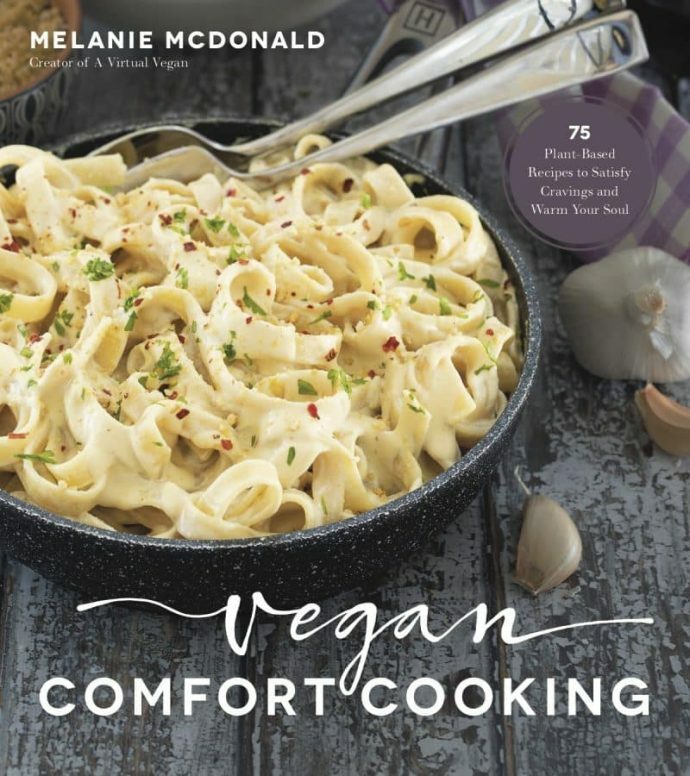 Great if you are having a dinner party or special meal. Made this omitting oil, salt and vegan butter and it was absolutely delicious! Leftovers were eaten for breakfast! My meat eating husband also approved! WOW. This is just fantastic. Made it tonight for family brunch tomorrow – I know its going to be a hit! I love the cashew cream. Thank you Emma! I’m so glad you think so and I hope your family enjoys it tomorrow! This looks like total comfort food! I love mushrooms.. I would love a big bowl of this now! Thank you Jenn. I don’t know what I’d do without mushrooms! This is such a wonderful recipe!! I cook this risotto atleast once a month. Being vegan I so miss those creamy yummy risottos. But this does all of that and more. Thankyou so much for sharing this recipe it’s so easy to follow and not a bit overwhelming. This is one of my all-time favorites! The risotto adds so much taste. After cooking this the first time, my son has requested it again and again. 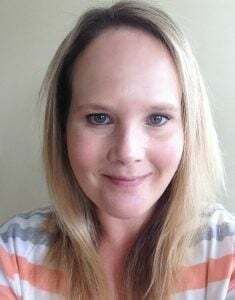 That’s great to hear Lisa! It is also one of my all time favourites. It is so rich and delicious. I do wish my son would eat it like yours though. He doesn’t ‘do’ mushrooms! I love how roasting garlic changes it so. Great recipe. Thank you! You can’t beat roasted garlic. If you think that making risotto is scary, totally understand as I stayed away to as it seem to take forever with the stirring and ingredients but let me tell you this: MAKE This ONE. So amazing. Exactly as said, creamy, smooth and oh so easy. If you are Italian like me and can’t eat any of the great recipes, throw them out and make this. Not kidding. And yes, I used David Rocco ‘s wine. Thank you for this recipe. Will be made againHad to physically walk away as I stood and ate half as I was typing. You go, girl with these recipes. Oh Stefania I am so pleased that you loved the recipe! And you’re Italian too, I am honoured. I too had the problem you did with not being able to stop eating it! It’s dangerously delicious. Thank you so much for taking the time to comment and for sharing a picture on Facebook. Your version looks fabulous! This looks so amazing and comforting. I’ve been really craving mushrooms lately, and this sounds perfect. I just pinned the recipe to try it later. Thanks lady! You’re very welcome Justine! Thank you for your kind words. It is so delicious. I am sure you will love it! That’s what l call comfort food, it looks amazing! I love how well mushrooms and garlic go together. Thank you so much! Mushrooms and garlic are just a perfect combo! I’ve only had risotto once, at a fancy restaurant, and was terribly disappointed. Literally did not finish the dish, and it was served tiny, California-cuisine style! Then when I learned that even the best chefs have trouble getting it just right, I thought I would never try it, but your recipe, descriptions and photos are so appealing that I may give this one a try, when I’m feeling extra adventurous. The idea of those flavors and textures roaming around in my mouth draw me in! You really must try it then Kathryn. You will love it. Don’t let that one bad experience put you off. Nothing beats a great risotto!